According to the 2014 IDG Enterprise Big Data research report, companies are intensifying their efforts to derive value through big data initiatives with nearly half (49%) of respondents already implementing big data projects or in the process of doing so in the future. Further, organizations are seeing exponential growth in the amount of data managed with an expected increas of 76% within the next 12-18 months. With growth there are opportunities as well as challenges. Among those facing the big data challenge are finance executives, as this extraordinary growth presents a unique opportunity to leverage data assets like never before. As the 3 V’s of big data: volume, velocity and variety continue to grow, so too does the opportunity for finance sector firms to capitalize on this data for strategic advantage. 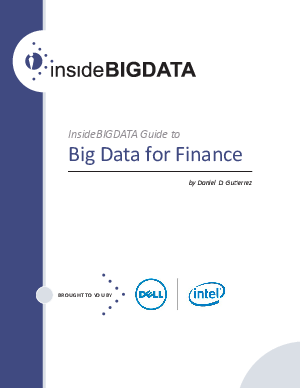 Finance professionals are accomplished in collecting, analyzing and benchmarking data, so they are in a unique position to provide a new and critical service making big data more manageable while condensing vast amounts of information into actionable business insights. ** You may withdraw your consent at any time. Please visit Dell's Privacy Statement for additional information or Contact Us for further inquiries.